You’ve made your website all about you. You’ve posted pictures of your best pieces. You’ve talked a bit about yourself and maybe a little about what your work means to you. You’ve listed the exhibitions you’ve been in maybe. After all, it’s your website! Of course it’s about you! It’s the biggest and most common mistake I see on people’s websites – especially art websites. Unless you’re already famous, why should anyone care? If you want to get some visitors and have a thriving website with an engaged audience – and who doesn’t – then you’ll need to change how you think about your website. You need to make it about them. Second, you need to completely repurpose your website. The “them” in this case is your visitors. 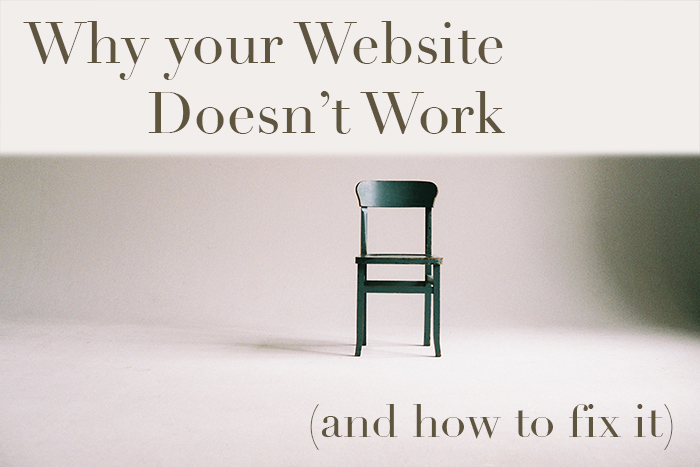 Nine times out of ten, this will be at the root of the problem, the reason why you don’t have many visitors, and why the ones who do come slide off your site like it was a frozen puddle. This artist is interested in painting plein air and catching the effects of light. This artist has been in these exhibitions and won this award. That stuff is meaningful for you but not particularly for a visitor to your site. If you can’t come up with an immediate and very good reason as to why it should matter to someone else, if there isn’t something useful there for a visitor to take away with them, it’s time to start taking a different approach. But just asking that question from the point of view of a visitor is very effective way to start to change how you look at your website. The whole point of your website is to enable you to create relationships with people. And the best way to do that is to offer something interesting or useful, in return for their email address. What most people do is have a semi-hidden link or half-buried form in the side bar that says something like “sign up for updates”, or just “Subscribe”. The point here is that if you want the opportunity to get to know someone who visits your site on a more meaningful level, you need to offer them something that means something to them. What this might be can vary widely. Here, on my site, I offer a free mini-course on colour. I’ve put a lot of work into it and I hope it contains something genuinely useful to the people who sign up for it. Because if someone gives me their email address in return for learning something useful about colour that will actually help them when they’re at the easel, that’s an opportunity for me to get to know them better. To begin to develop what I hope will be a more meaningful relationship, over time. I’ve tried very hard to make this site about you. Ok. But how do I Get Visitors in the first place? I’m not being flippant, I really am glad you asked! Because that’s something I’ve specialised in for a number of years as a day job. It wasn’t a day job I liked much, in fact I often hated it. But I learned some very useful skills that I can share with you so that you can start to get people visiting your site. It’s too much for me to go into today, I wanted to give you an overview here and to introduce the biggest shift in mindset that most people have to make if they want to get their sites working as they’re supposed to. That’s enough to be going on with for now, because it has far reaching consequences. What I will do now is give you a quick overview of where your visitors will come from. Search Engine Optimisation. Does your site show up on Google if you search for your name? If it doesn’t, I bet I know why! Social media: For me this is mostly Facebook and Instagram. This can be a great source of visitors because although Google will likely send you more visitors, people who come to your site from your social media feeds already know who you are. Other websites. If another site links to yours, some of its readers will follow the link. Whilst this will probably be the smallest source of visitors for you, they come with a personal recommendation from someone who runs another site that they read – that’s pretty powerful! Over the next few weeks, I’m going to publish a series of posts here, one about each of those three sources of visitors and how to attract them. I’ll also cover how you can make visitors into relationships. Everything comes back to this. Make it about them. Yesterday I opened the doors to a new program I’ve set up to help artists work towards making some or all of their income online. It’s what I do and something I have a lot of background in. Threads is an online community with training on growing an audience online and developing your painting skills, and is delivered by private live stream with new topics every month. The community part is a monthly video meet up for members, and a private facebook group where you can get feedback and support. It exists to help you live a more meaningful life as an independent artist by making your living online. Paul, what you’ve written here is interesting and informative. It’s something you’ve spoken about on your webinar, too. One thing that is not clear to me is the audience that we want to cultivate. In other words, with Learning to See, your audience is clearly “aspiring realist artists.” For most of us who are looking for ways to bring traffic to our websites, our audience is primarily people who might be inclined to buy our art. So, for example, it seems to me that offering something like a course on color mixing to a general audience interested in art, but not as artists as a premium for joining our mailing list, won’t have the same draw as it would for aspiring artists. I wonder whether you could elaborate on ways to attract general audiences to our websites rather than a very specific audience such as aspiring artists? Or maybe talking about a general audience the way I’m doing here is not right. Perhaps talking about a different kind of specific audience, say, people who are disposed to buying and collecting art might be more of a help for us. Good question Martin. Great question, actually. What I’ve found is that the people who buy my work are the same people who are interested in learning from me. I’m not the only one selling online who has found this either. In short, the people who will buy your work online are other artists. The general buyer interested in obtaining art but not in making it is more likely to go to a gallery or something similar to buy. The chances of you attracting people like that is minimal. The handful of works that I’ve sold that weren’t through galleries were, however, to non-artists who saw my work on Facebook and contacted me about buying. I’ve never considered trying to market to artists; your experience, however, seems to say that this can indeed be a viable market. I’ll definitely have to rethink things a bit — something that’s always worthwhile.